In among all the sad sad stories we hear here in Haiti, among all the people who come to the door for food and for money I just heard a miracle today. One of the ladies who works in the Bundy's house told Angie (Bundy) something super exciting. Her name is Gladys. Her grandson was living in Port with his auntie, his parents are both dead (before the earthquake). During the earthquake he got separated from his Auntie, in the midst of all the chaos he ran away. Their house was destroyed and the family looked and looked and couldn't find him, he is only 10 years old and they all assumed he was dead. 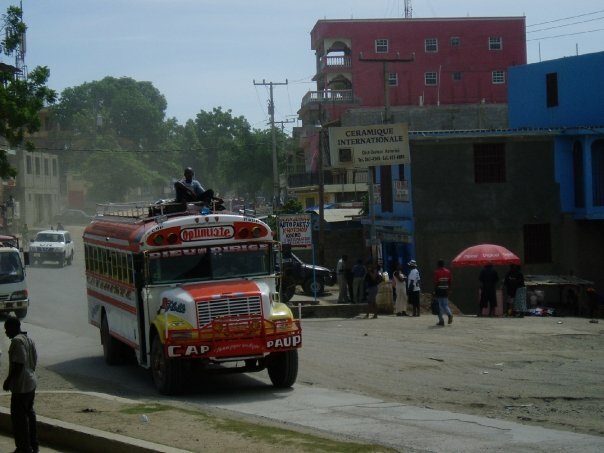 He spoke to some people and said he thought he had a granny in Cap Haitian, so someone paid to put him on a bus into Cap Haitian. It had been a few years since he had been in Cap and didn't have any idea where to go. He got off the bus when he recognised a place so got off and spoke to a few people who helped him find his Granny! So 3 months later the boy arrived safe and well at his Granny's house outside of Cap Haitain. It really is a miracle. Gladys kept saying 'why has God chosen to help me like that, Who am I that I should deserve this miracle!' But that is exactly the kind of God we have, one who loves us and cares about us. I have just been working in Milot a few days a week and in our clinic the other few days. The Patients at milot are really starting to get much much better. We had one lady, Yolande who had a partial spinal cord injury in the earthquake, she had a fixation of her back. When I first when she was walking with a frame, with a back brace on, and splints on her feet and the help of at least one person. Now she is walking with a stick, with no brace, with no splints. Its so great to see their improvement. We have this ultrasound in our clinic which no one knows how to use. I wrote about it before. Hannah and I and all our missionaries have been searching and trying to find anyone who does ultrasound to come down to be able to teach Hannah how to do it, especially for pregnant ladies, as we have about 100 pregnant ladies who come each Wednesday and if there are any problems we have to send them somewhere else which is more expensive for them. On Saturday Hannah and I were out at Milot and a new team had just arrived. I'm not sure exactly how we found out but they have an Ultrasound tech here from the US, so we met him and asked if he would come out to our clinic even for a day to do a bit of training. (Not that you can learn ultrasound in a day!but its better than nothing). He very happily agreed and was out today training Hannah all day which is great. Its amazing how God sends people when you need them. We'd been looking and looking and here someone arrived in Haiti without us even trying!! The last time I was in Haiti I treated a wee boy who had Cerebral Pasly. His name was Luvinson and he was 5. I loved him coming, he was so cute and used to come in and sing to me every week. He is affected down one side by his CP, but he is mobile and manages very well. The only thing he did have was his wee right foot was contracted and he walked right up on his tip toe. So I really wanted to see him when I got back but I forgot to bring his mum's phone number with me and I totally forgot where they lived. 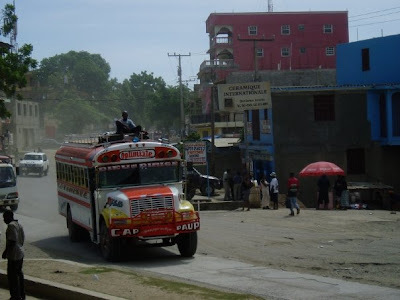 I was driving home from Milot a few weeks ago and I was stopping along the way to get phonecards and everywhere I stopped they didn't have any. And I was driving along thinking about Louvinson because I thought we were about in the area they lived in, I pulled over to get phonecards and I heard someone shouting my name. I looked over and it was Luvinson with his mum!I couldn't believe it I had literally just been thinking about him. Then next week he came to visit me in the clinic, it was so good to see him. There is an orthopaedic surgeon who visits the big hospital in town, he is american but lives in the Domincan, so she had taken him there and he had had surgery to fix his wee foot. He looks great and is doing really well. There is no way I would have been able to find him and the very moment I was thinking about him there he was. Each night we were down in Port we stayed up with the students talking and laughing (alot), practising creole/ english (some people here think I need to practice my english!! ), learning more about each other's cultures and then telling our stories to each other. How we got to where we are today, how a group of people from 4 different countries are all together in an extremely poor area of Port-au-Prince, Haiti over easter weekend telling people about Jesus. I was born in Port, my mum was just 16 years old when I was born. My father already had a wife and 2 children, he has cheated his wife. After I was born, my mum looked after me for a while but then when I was about 9 months old, I got really sick, so my mum put me in a cardboard box and left me on the front step of my father's house. I have never seen her since then. My grandmother was the first person to find me, except she did not know who I was because my father never told his family about me. She just left me in the box until my father got home that evening. When he looked in the box he said thats Nicole. Then he had to explain to his family who I was, his wife wanted to leave me where I was to die. But my grandmother said she has always prayed for a little girl so she would look after me. My grandmother died when I was 4 and I had to live with my father and his wife, I was treated as a slave in my own home. When I was 12, I gave my life to God and he saved me, I began to pray and pray, I was always praying. I grew up, got married and had 5 children, 3 of them are my own and I adopted 2 who were abandoned. I was a teacher but I felt like God was calling me to do more, so I joined seminary in Port. I was in 3rd year when the earthquake struck. on 12th January I was in my house with my children, my husband was at work. I felt the house shaking and then saw the walls move and ran outside, praying God would save me. By God's grace my family were not hurt. But we had to then sleep on the road, our house was destroyed. The first night (Tuesday) after the earthquake I left my children and went out to the street and began singing to the Lord, soon people began joining me and we sang praises that whole night. We slept in the street until sunday then a friend of mine gave us an opportunity to go to northern Haiti she knew someone there who would look after us. I went with my kids and my husband stayed behind in Port to try and build us a house. When we arrived I felt God telling me to go and evangelise the area, I never been to this area but I obeyed God. All week I spoke to people about Jesus and many people came to know him. That friday I met a pastor (it was actually Pastor Exalus who is the pastor for our clinic) he invited me to his church on sunday, so I went. He asked me to share about Port-au-Prince and I also shared something from God's word. After he asked me how do I know the bible so well, I said because I was in seminary in Port-au-Prince. He then told me he heard Emmaus seminary were accepting students from Port for free, did I want to go. I said I would pray about it and I did. That Tuesday while I was praying I felt God say to me, pack your bag you are going to seminary. So I phoned Pastor Exalus and he said no wait until I find someone who can take you, I said no God told me to go today so I went. When I arrived I spoke to Pastor Paul Vilmer, and he said we are starting class tomorrow you arrived on a good day!And that is how God has lead me to where I am today, I should have been dead, first as a baby then during the earthquake but God has saved me. Nicole in action with the kids, she told the stories and she was brilliant. I loved getting to know the students last weekend,we spent the weekend talking, laughing, praying and alot of singing....those guys can sing they were great!! !They all have such amazing stories and God has clearly guided them to where they are today. We got back from a wonderful weekend in Diquini, Port-au-Prince. This is where we had run the medical clinics in January after the earthquake, where nearly 600 people gave their lives to the Lord and where one of our seminary students Junior is living right now, in a tent on the top of the mountain to plant a church and disciple these new believers. The purpose of the trip was for two things, to encourage Junior, to give him rest and also to run a evangelism crusade up in Diquni. On Thursday morning 21 of us were all ready to go for the weekend, 8 missionaries and 13 of the students from the seminary and it was pouring. It had been raining all night, stopped for a little bit in the morning then at about 6.45 it poured and did for the next 3 or 4 hours. Remember Haitian people Hate the rain (as do I!!) but it didn't matter everyone was excited to be going, so we loaded up in the back of the truck in the rain and headed off for the 8/9 hour journey. I cannot say the truck journey was fun, apart from a very special time.......... here we were, 21 of us from 4 different countries (Haiti, America, Northern Ireland and England) in the back of a truck, in the bucketing rain getting soaked driving through the mountains of Haiti singing together and worshipping God in Kreole and in English, it was lovely. After what felt like a very long time we arrived in Port, I didn't see alot of difference to the last time I was there. The buildings which had collapsed are still there and have not been cleared up. There is still tents everywhere, in fact I would maybe say even more on the way into Port, the difference is the tents are now not just sheets but they have tarp and plastic over them which is much better for the rain. Then we drove up the mountain to Diquini. Right at the top of the hill there is a building which used to be a guest house for a weslian seminary (I think). The building is basically empty, no electricity, no running water so we stayed in tents in the land around the building.Actually for a few hours each evening we had some electricity from the generator we brought with us. It was great, the view is unbelievable you can see all of Port-au-Prince, you see the sunset and the sunrise over the mountains and the beauty of God's creation. Thursday night the youth group which Junior had started wanted to do something for our team, so they explained to us what they had been studying, then served us dinner which was lovely. Only later did Junior tell me that the whole thing was their idea, that they all put money together so they could do that. These people are so poor, they literally don't have anything. To find money to put together to get us food would have been a great sacrifice for them. Then they had a showing of the Jesus film on Thursday night just outside where we were staying. And friday began the programme of evangelism and kids club. Seven of us ran the Kids club from 8 to 10 in the morning, well that was the scheduled time but we are in Haiti so it was about half 8 before we got started. we had around 60 to 80 kids each time. Started off with some singing, praying, then a story, a memory verse and some songs in English. On friday morning we looked at Abraham and how he obeyed God with the verse from Genesis 15 v 6 'And He believed the Lord, and he counted it to him as righteousness'. Creole being so simple translated word for word says....Abraham put his trust in the Lord and He gave him Grace. Friday afternoon was about Jonah and his disobedience and the result of that. The verse was Psalm 30 v3 (From creole) You brought me out of a big pit, You gave me life and You did not leave me to die. Yolane (who was teaching the verse) did a great job and she compared it to what had happened in Port, that alot of people died in the earthquake and its only by God's grace that we were there, it was very powerful especially seeing all these kids are living in tents and literally have nothing. Saturday morning was the story of Jesus death and resurrection and his obedience to his father in Heaven. The Verse was John 11 v 25 'I am the resurrection and the life. Then on sunday afternoon we had a special programme, a revision of the stories, of the songs we had learnt, the memory verses, a quiz and each child got a wee bag of a colouring book, crayons, a copy of Johns gospel and some biscuits and sweets. You should have heard them answering the questions, they listened so well and knew all the answers and same with their verses. At home we write out the verse, repeat it loads of time etc...In Haiti they repeat it about 5 times and that is it, they know it. About 6 of them got up and said all 3 verses and a couple of them were only 5 or 6 years old. While we were doing the kids club the rest of the seminary studnets were out in the area doing evangelism, encouraging those new believers who had given their lives to God in January. Then each evening at 5 (well 6 by the time we got started) we had a service. The Students led all the services, praying, singing and preaching and they were brilliant. In the 'church' we had about 200 people packed in and Im sure there were around 100 or more standing outside. The presence of God and his Holy Spirit was so clearly felt. Throughout the weekend through the evangelism and the services there were nearly 100 people who decided to become christians. The studnets we were with were brilliant, 4 of them were in Port during the earthquake the rest from Cap Haitian. Each night we sat and listened to their stories of how they got to be where the are today, they are amazing. Its amazing how God works things out. I'll write about some of their stories when I get a chance. One more thing, a while ago I told you about Junior, the student who stepped up to God's call to leave seminary for now and go live in diquini to plant a church and disciple the new believers. He has been living by faith!He went to Diquini, lives in a tent and some ladies from the community cook for him. He is working very hard with bible studies for the young people every morning from 5 to 6, he visits people in the comunity aswell as church on sundays. He is very weary and lonely at times. Please continue to pray for him, God is using him and we praise him for that. We are praying God will call 2 more people to Diquini to go and help Junior. I could probably write more but that was just a wee taster of the weekend and how God was working. Praise the Lord! !